The architecture of any place is a very integral part of its culture and tells a lot about its cultural development. The architecture of Uttar Pradesh, a state in India, reflects a pretty much precise picture of its cultural development throughout the past several years. The architectural style of each era of Uttar Pradesh depicts the culture of that time. Many different styles of architecture can be found in Uttar Pradesh. There are buildings that mainly comprise of the Buddhist style, the Hindu style, the Indo-Islamic style, and the Indo-European style. During sixth-fifth centuries BC, capitals of different kingdoms developed into cities. Besides residential structures of different sections of society, these urban centres also had mud fortification of enormous width and height around them. With the advent of Buddhism, Buddhist viharas (convents) comprising various types of structures including huts in the earlier period and well laid out brick structures having many rooms in the later periods were constructed. Many stupas were also built at that time. 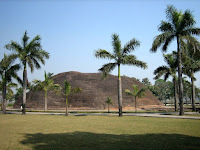 Initially they were elevated egg-like structures of mud, but in the subsequent period it was lined with bricks, a square harmika and a chattravali (umbrella) were constructed on the top of it, and staircases were added to reach the top. The subsequent periods, including the Gupta period, saw a lot of religious style of architecture. Numerous temples were built. It is difficult to assign any precise date to the beginning of temple architecture on the basis of available evidence. However, it is generally believed that the first temples might have been constructed a couple of centuries before the beginning of the Christian era. An example of the plan of about 1,800 years old apsidal brick temple is known from Mathura. The architectural wealth of Uttar Pradesh representing the next six centuries were brick and stone built temples dedicated to various deities. A good number of architectural members, sculptures and plans of these temples found at different places show that these were located in almost every part of the state. 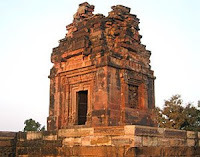 Notable examples of temples belonging to thirteenth and fourteenth centuries are known from Varanasi and Sonebhadra. The Varanasi temple is located at Kandwa and is famous as Karmadeshwara Mahadeva. A remarkable innovation in these temples is the treatment of shikhar (upper portion) with multiple shikharikas (small shikharas) which provide an additional attraction to the structure. The arrival of the Muslim rulers, marked by the establishment of the Sultanate period, heralded a new era of assimilation of diverse elements of art and culture. The Sultanate architecture created a possibility of assimilating new ideas, forms and techniques in Indian architecture. This gave rise to a process of a dynamic synthesis, which led to a cultural rapprochement and fusion of two diagonally opposite artistic traditions. The fusion of Islamic architectural designs with indigenous craftsmanship produced a series of architectural masterpieces in India, especially in Uttar Pradesh. The building of mosques, tombs, palaces and cities was the favourite hobby of the Muslim rulers. The indigenous artists evinced a great level of capacity for adaptation when they had to work under Muslim patronage. As the number of foreign artists was always comparatively negligible, the Muslim rulers were obliged to depend on local artistic genius. The indigenous artists, despite adhering to the basic form of the buildings according to the directions of their Muslim patrons, could find ample scope for the introduction of some of their own ideas and standards of art and craftsmanship, which were not familiar to the ideals of Muslim art. This led to a blending of forms and thus gave the Muslim buildings of India a new look, which were quite different from similar buildings in Muslim countries outside India. Pictures (from top to bottom): Jami Mosque (Badaun), Jami Mosque (Jaunpur), Atala Mosque (Jaunpur), Shahi Fort (Jaunpur) The foundation of the Mughal Empire led to the most fascinating and productive era in the history of Indian architecture. The Mughal architecture was inspired by the magnificent architectural heritage of central Asia. All the great Mughals had a perennial fascination for Central Asia, and it is therefore, not surprising that the essential elements of Timurid structures of architecture find prominent place in Mughal monuments. The Timurid structures were known for their impressive scale, admirable symmetry, brightly glazed tiles as well as spacious and well laid out gardens. These can also be found in Mughal buildings as well. The legacy of the pre-Mughal architecture, the monuments built by the Sultans of Delhi, also played a significant role in the development of Mughal architecture. Notably, much of the architectural traits of the Sultanate buildings, which the Mughals subsequently used in their own monuments, namely, flat or corbelled roofs, curved brackets, deep eaves, narrow columns, chatris and motifs such as bell and chains, strings of rudraksh and torana, etc., were borrowed by the Sultanate from the pre-Turkish Hindu architecture. 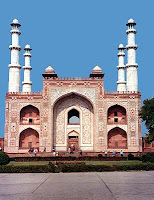 Mughal architecture is said to be the heir to the rich traditions of both central and south Asia. Mughal architecture was, thus, a blend of Hindu, Islamic, and Central Asian culture. It would be improper to write about the architecture of Uttar Pradesh and Mughals without writing anything about the glorious Taj Mahal. The Taj Mahal, built by Shahjahan, is the mausoleum of Shahjahan’s wife Arjuman Bano Begum (Mumtaz Mahal). The tomb is seen all over the world as the symbol of India’s civilizational attainment of the early modern period. In many ways the Taj Mahal also represents the culmination of the evolution of the Mughal style of architecture. While the main structure around it are modeled on Humayun’s tomb, its accessories – a high, red sandstone walled enclosure and the imposing gateway with beautiful calligraphy on white marble slabs - have been borrowed from Akbar’s mausoleum. The choice of the building material, the white marble, and the decoration motifs in pietra dura technique are supposedly influenced by Itmad-ud-Daula’s tomb. The spacious garden with flowerbeds and water channels leading to the main building is said to depict the image of paradise on earth in the mind of the onlooker. The coherence and lucidity of the external architectural effects of the Taj Mahal is said to be a fascinating aspect of the monumental structure. The arrival of the Europeans saw the emergence of a new style of architecture, the European architecture, or what is generally referred to as colonial architecture, and made a deep impact on the architectural activities of Uttar Pradesh. 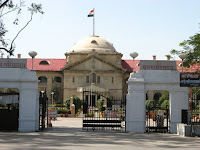 The influence of European architecture is clearly evident in the buildings of Allahabad, like, the University of Allahabad and the High Court. The ornamental designs of these buildings, as well as many of the buildings in Lucknow and other places in Uttar Pradesh, clearly reflect a beautiful combination of eastern and western architectural styles. The buildings of this time saw the presence of the old usual domes and towers with a modern colonial touch to them. These colonial structures are a good source to understand the patterns of synthesis between the two architectural traditions. The architecture in Uttar Pradesh throughout the ages shows that each era had its own unique style depending on the culture of that time. One thing that is quite noticeable is that throughout the years whenever there has been a new emerging culture, it did not in any way supersede the architectural style of the culture that preceded it. The new civilization, in fact, took instances of the previous culture and incorporated it within its own original style, and therefore, developed a completely new and different style of architecture. The different styles of architecture in Uttar Pradesh clearly depict the cultural assimilation and amalgamation that has taken place throughout the years, right from the pre-Buddhist era. In a way, the architecture of Uttar Pradesh is a clear and concrete reflection of the cultural development that has taken place in the state of Uttar Pradesh. Very informative post... I have a friend who is an architect and this post will definitely be a hand on designs especially touching diverse cultures to enhance anything about how things look.. Good post! Yeah I must agree that it is a very informative post, I even learned something new and found put things that I didn't know before..
Good work :)... I finally remembered to check this post of yours. The size of the post is just right and not really long as you were saying. How did you get to take the picture of Allahabad High court? I remember they didn't let me take pictures of that building when I was there 2 years ago. ive just started studying psychology im in school, its such an amazing discipline and it shows in the diversity of your posts. Excellent photography and exposition. I really enjoyed this post. My best to you and this blog. Enjoyed this post very much, and not just because I am an urban designer. Beautiful expression you have given of every detail in India. Tis a place I would like to visit one day. Excellent post, beautiful pictures with good descriptions. I like the way you have traced the changes in the architecture of the buildings. Its very nice the way you have ended with more recent buildings at the end of your post. Interestingly all buildings have been built by rulers. But say a city like Gurgaon comprises buildings by private companies and individuals. Really awesome blog there is lots of wandering place.